Note : The given function F(s) can be expressed in partial fraction form only when degree of N(s) is less than D(s). Now in the remainder, degree of N'(s) is less than D'(s) and hence F(s) can be expressed in the partial fraction form. 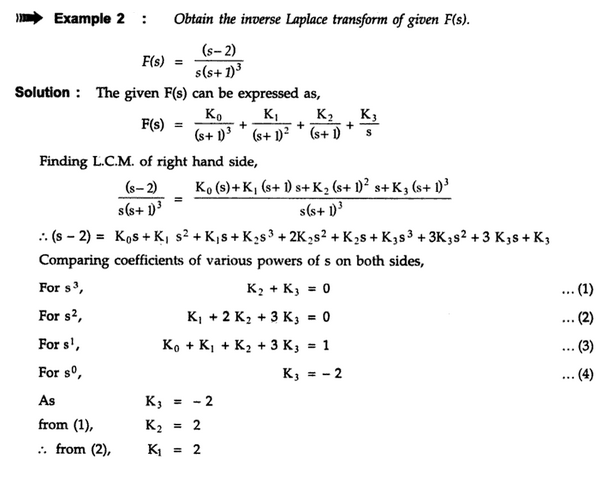 Once F(s) is expanded interms of partial fractions, inverse Laplace transform can be easily obtained by adjusting the terms and referring to the table of standard Laplace transform pairs (Table 1). The roots of denominator polynomial D(s) play an important role in expanding the given F(s) into partial fractions. There are three types of roots of D(s). The method of finding partial fractions for each type is different. Let us discuss these three cases of roots of D(s). 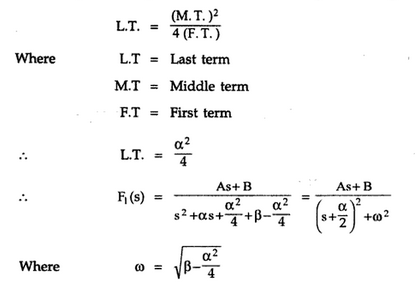 is standard Laplace transform pair. 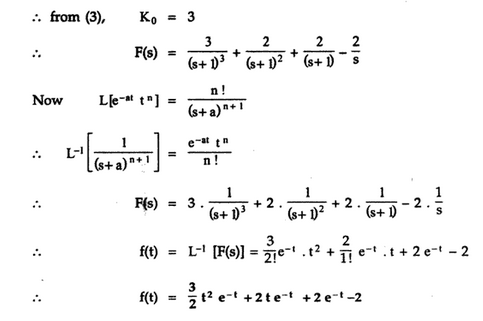 Hence once F(s) is expressed in terms of partial fractions, with coefficients k1, k2 … kn, the inverse Laplace transform can be easily obtained. Note : Thus a separate coefficient is assumed for each power of repetitive root, starting from its highest power n to 1. For ease of solving simultaneous equations, we can find out the coefficient k by the same method as discussed for simple roots. 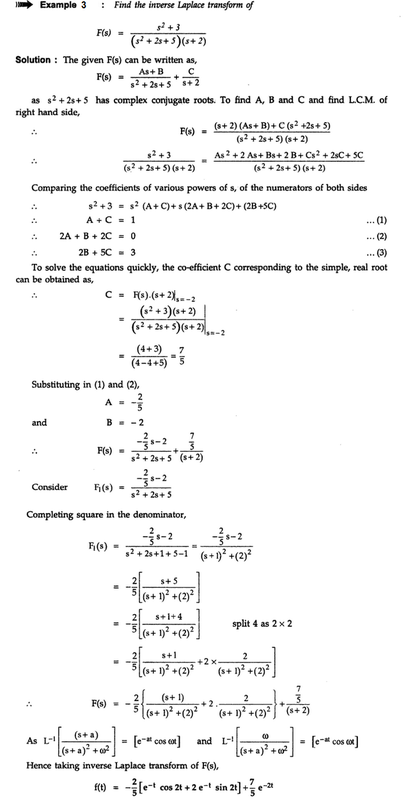 Similarly coefficients for simple roots present if any, can also be calculated by the method discussed earlier, for ease of solving simultaneous equations. 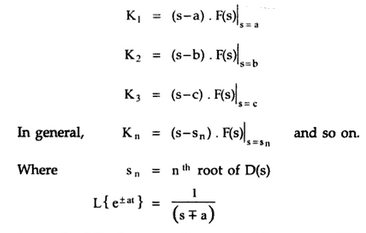 The method of finding the coefficients in such a case is same as discussed earlier for the multiple roots. 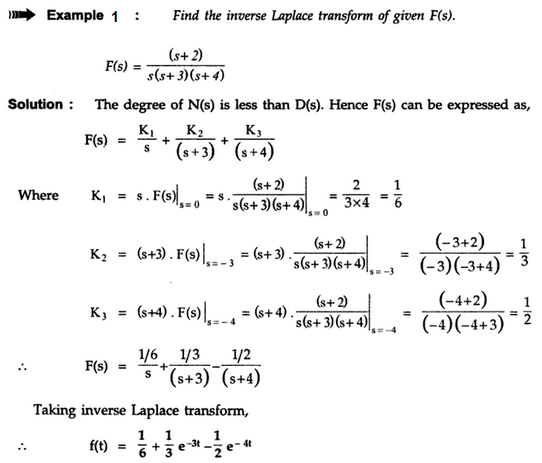 One A and B are known then use the following method for calculating inverse Laplace transform. Note : Thus inverse Laplace transform of F(s) having complex conjugate roots of D(s), always contains sine, cosine or damped sine or damped cosine functions.